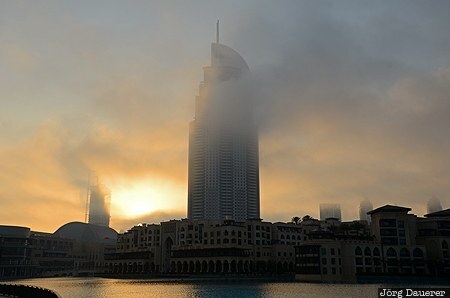 The Dubai Mall backlit by soft morning light and surrounded by morning fog with the Burj Khalifa Lake in the front. The Dubai Mall is the world's largest shopping mall (based on total area). Dubai is the Emirate of Dubai, United Arab Emirates (UAE). This photo was taken in the morning of a sunny day in March of 2012. This photo is part of the exhibition Urban Fog (October 2018). This photo was taken with a digital camera.